For those unfamiliar with Halfbakery.com, it's a website featuring half-baked inventions and concepts from anyone that creates an account. While the ideas don't have to be well thought out, not even a little, with so many authors and posts the effect is something like monkeys at typewriters. So there really is a huge range of ideas from the sublime to the ridiculous (and some many which are both). In fact, I usually consult halfbakery.com before I post anything on They should…, and if I had a company I'd scour the site daily for the next big thing, because I'm sure it's on there. The site is pretty much perfect, except for the total lack of pictures and there are so many ideas and categories it's a little daunting to even casually browse. 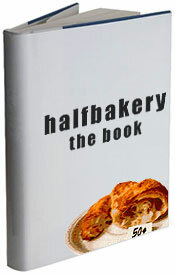 They should really make a Halfbakery book with pictures of the highest rated inventions as well as some underappreciated editor's picks. Given the talent for making "fake" products that's out there, they could easily hire designers to create mock-ups of all the inventions. I could totally see a book like this being on par with the popularity of something like The Worst-Case Scenario Survival Handbook.